The acquisition seems a shrewd deal for Aegis and the regional agency's owners, Andy Jeal and Dave Lucas. For Andy Jeal and Dave Lucas, what goes around most certainly seems to come around. Back in 1994, when they left an agency called TMD Manchester to set up on their own, they attracted the backing of The Media Centre, a media operation spun out of the once-legendary Masius media department. The Jeal and Lucas operation became The Media Centre Manchester. And when The Media Centre morphed into MediaVest, Jeal and Lucas did too. But then, as the years went by and MediaVest became subsumed into the international Starcom MediaVest network under the ownership of Publicis Groupe, it seems that matters Mancunian began to slip the Publicis corporate mind. There was even a mild internal spat when senior Publicis managers demanded to know what this bunch of people somewhere up in the north of England were doing passing themselves off as MediaVest. It is worth speculating that this particular episode did not necessarily serve to convince Jeal and Lucas that their Publicis relationship had evolved into a marriage made in heaven - though they'd never, of course, say as such. Consummate diplomats that they are, they have nothing but good things to say about Publicis. Last week, though, having bought out the 19.9 per stake that Publicis previous held, they sold the agency to Aegis for an initial payment of £27 million and further payments rising to a possible total (depending on performance-related earn-out criteria) of £95 million by 2016. Aegis, of course, owns Carat - and Carat is the successor agency to TMD. So, in a cutesy symbolic and metaphysical way, you can argue they're back where they began. Sort of. In other ways, naturally, they've come an awfully long way. "We are really excited about becoming part of Aegis Media and operating with brands the strength of Carat and iProspect," Jeal says. "As part of Aegis Media, we feel perfectly placed to continue to grow our business through planning and implementing market-leading, media-neutral solutions for our clients that deliver demonstrable return on investment." The really telling word here is "iProspect". It's Aegis' heavy-hitting international digital media brand. Why, you're duty-bound to ask, should a regional media agency be interested in that? 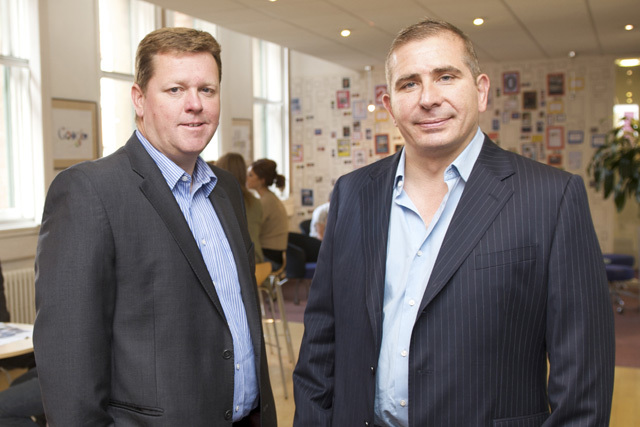 MediaVest Manchester, which will now operate under both the Carat and iProspect names, is currently the UK's fourth-largest digital media agency. Think "regional media agency" and what tends to come to mind is a roomful of sitcom cliches buying ads in local newspapers for local retailers. Jeal and Lucas admit they do a little of that - but it's hardly the real thrust of their enterprise. In fact, they argue, you shouldn't think of this as a regional media operation at all. They prefer to think of it as a national agency based in Manchester. Its national clients include Holland & Barrett, JD Williams, Barratt Developments and Thomas Cook. It has offices not just in Manchester but in Leeds, Newcastle and Edinburgh. "As a regionally based business, we have significantly lower overheads, so we can invest more in people," Lucas adds. "That means the agency is properly geared up to handle performance and ROI business, especially for clients that want to drill down into the detail." This has never seemed the sort of talk (betraying, as it does, Jeal's and Lucas' heritage in direct marketing) designed to set hearts a-fluttering at Starcom. Yes, in VivaKi, Publicis Groupe has a world-class digital operation at group level. And it's also true that, in recent years, Starcom has made efforts to put digital at the heart of its offering. But it has never revelled in the unglamorous number wrangling that direct clients live and breathe. Rob Horler, on the other hand, has and does. Horler is now the chief executive of Aegis Media UK, but he was previously the managing director of Diffiniti and Carat Interactive. "The acquisition will boost our position in the market," Horler says. "David, Andy and the whole MediaVest Manchester team have built a great business over the past few years and they will be a great addition to our group." Jerry Buhlmann, the chief executive of Aegis, adds: "Our strategic priority at Aegis Media is to continue to develop best-in-class digital and media solutions for our clients - and we have made it clear that we would be looking at strategic acquisitions that provide scale, infill and innovation. This acquisition does just that." Aegis gets an under-appreciated gem. Jeal and Lucas get a new opportunity to take their agency to the next level. Plus, obviously, in the here and now, a better measure of the cash reward they think their efforts have earned. Jeal, who is 49, claims to be a triathlete and is a Mancunian by adoption. A Norwich City fan, he hails from Great Yarmouth but did his degree in the city and stayed, joining TMD Manchester early in his career. Lucas, 46, is a right proper Mancunian (and, as such, he adds, he obviously supports City) who dabbles in a bit of cricket and gardening. He actually began his career in London at LWT in the late 80s but, like Jeal, joined TMD early in his career and has stayed the distance. They both pride themselves in having strong relationships with London-based media owners at the highest level: and, like all successful double acts, they describe their talents as being complementary. Jeal is more market-focused and is more extraverted; Lucas is, in Jeal's words, quite simply "the brightest bloke I've ever met". And he may well be - but one observer says he reckons he knows the true secret of their success: "They're both smart, obviously - and they moved into digital in a way that most London media agencies can only look at and envy. But their secret is that they're genuinely close to their clients. They're seen as genuine business partners - and, believe me, that's rare."